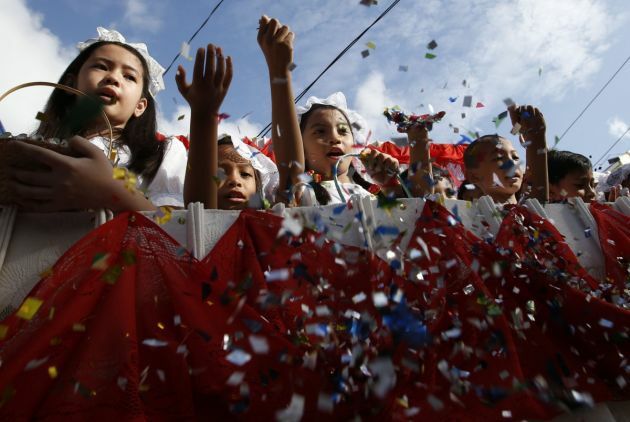 (Photo: REUTERS / Erik De Castro)Pupils sing a religious hymn "Hosana," meaning Savior, as they throw confetti from a truck during Palm Sunday in Mogpog town on Marinduque island in central Philippines April 13, 2014. Filipino Roman Catholics flock to churches with palm fronds as they observe Palm Sunday, marking the start of Holy Week. Pope Francis will pay a two day visit to Sri Lanka in January 2015 and then to Philippines he announced during a news conference in the aircraft on his return home to the Vatican from the Holy Land. "There are two Asian trips planned: one to South Korea [August] and then next January, a two-day trip to Sri Lanka and the Philippines, to the area affected by the tsunami," the Pope said during his May 26 inflight press conference. In November 2013, the devastating Typhoon Haiyan struck the Philippies during one of the strongest storms recorded and more than 6,300 people were killed. Francis, who is the leader of 1.2 billion Catholics, will be the third pontiff to visit the Philippines, the country in Asia with the greatest number of Christians. Pope Paul VI visited the Philippines in 1970. St. John Paul II visited the Philippines in 1981 and again in 1995 during a trip that included Sri Lanka, Australia, and Papua New Guinea. In February, Cardinal Malcolm Ranjith of the Sri Lankan capital of Colombo had invited Pope Francis to visit the country, Catholic News Agency reported. "I welcome this invitation, and I think the Lord will grant us the grace," the Pope told Sri Lankan pilgrims at the Vatican Februay 8. Pope Francis also acknowledged that "many tears have been shed" by the victims of the country's decades-old civil conflict. Urging the healing of wounds and cooperation between the country's ethnic factions to work for peace, noting that this is "not easy," CNA reported. There are about 1.2 million Catholics in Sri Lanka out of a population of over 22 million of whom about 6.2 percent are Christians. Sri Lankans are predominantly Buddhist, though there are sizeable Hindu and Muslim minorities. The Philippines is a predominantly Catholic country, with about 81 percent of the Philippines estimated 107 million people Roman Catholics. Other Christians account for about 7.5 percent of the population and there is a significant Muslim minority. Meanwhile South Korea has invited members of North Korea's Catholic community to attend the upcoming mass to be held by Pope Francis in Seoul, the Yonap news agency reported. Pope Francis will celebrate the mass at Myeongdong Cathedral in Seoul on August 18 and deliver a message for peace on the divided Korean Peninsula. Almost 32 percent of South Korea's 49 million population are estimated to be Christians of whom some 10 percent are Catholics.